For the BEST routine for this trick, we recommend "The Wit and Wisdom of Mark Lewis"; CLICK HERE! The Wizards' Journal #8 - in Print! 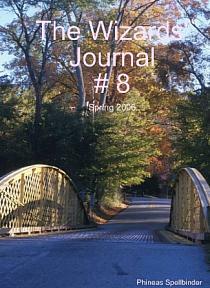 This issue of The Wizards' Journal #8 is now available as a fully printed paperback from Lulu.com: 87 pages, 8.5" x 11", perfect binding, full-color interior ink - $50.00 plus shipping. *** Planning to make a "magic kit" for a youngster who is just starting out in magic? The tricks marked with three red asterisks are good for that purpose! Also consider just giving the kid the materials, all cut out and ready to be constructed with your help!